A 6 month old baby with congenital left side abduction deficit. Clinical diagnosis: Duane's Retraction Syndrome. MRI Brain performed for 6th CN with MRI Orbit. 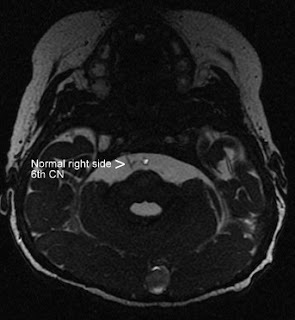 Sequences planned are FSE T1W, FSE T2W, FLAIR, and DW images show no significant abnormality in Brain parenchyma and region of cavernous sinuses. Axial and Coronal T1 T2 STIR for orbit show normal optic nerves and extra occular muscles. On Axial FIESTAs for Cranial Nerves 6th CN not visualized on left side. Cisternal portion of Right side normal 6th CN nerve marked with arrow. Rest of the CNs normal, particularly facial and trigeminal nerves. Normal symmetric cisternal portions of bilateral occulomotor nerves. 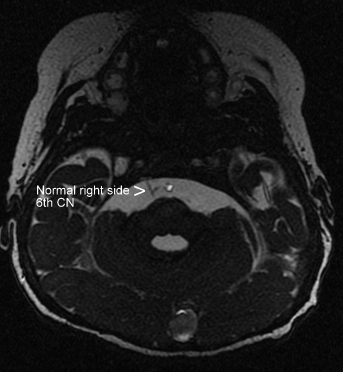 Cisternal portion of left side 6th CN not visualized - Congenitally absent. Consider the diagnosis Duane's Retraction Syndrome (DRS) clinically. NB: Characteristic diagnostic signs of DRS (congenital abduction deficit accompanied by retraction of the globe on attempted adduction) might not be manifested in early childhood or may be difficult to evaluate, a successful demonstration of absence of the abducens nerve on MRI strongly suggests DRS in children with abduction deficit - Reference: AJNR 2005 26: 702-705 MR Imaging in DRS, Jae Hyoung Kim. A rare, congenital disorder of eye movement characterized by the inability of the eye to abduct, to move outwards. The condition involves neural pathways associated with the sixth cranial nerve. DRS was first described by Jakob Stilling in 1887 and Siegmund Türk in 1896 and subsequently named after Alexander Duane who discussed the disorder in more details in 1905. Other names for this condition include Eye Retraction Syndrome, Sausage Eye, Retraction Syndrome, Congenital retraction syndrome and Stilling-Turk-Duane Syndrome. 1. Limitation of abduction (outward movement) of the affected eye. 2. Less marked limitation of adduction (inward movement) of the same eye. 5. A face turn to the side of the affected eye to compensate for the movement limitations of the eye(s) and to maintain binocular vision. DRS is a miswiring of the eye muscles, causing some eye muscles to contract when they are not not supposed to contract and other eye muscles not to contract when they are supposed to contract. Alexandrakis G and Saunders state that in most cases, the abducens nucleus and nerve are absent or hypoplastic, the lateral rectus is innervated by inferior division of the oculomotor nerve. This misdirection of nerve or mis wiring results in opposing muscles being innervated by the same nerve at the same time. Thus, on attempted abduction, stimulation of the lateral rectus via the oculomotor nerve will be accompanied by stimulation of the opposing medial rectus via the same nerve. Thus, co-contraction of the muscles takes place, limiting movement and resulting in retraction of the eye into the socket. Most patients are diagnosed by the age of 10 years, more common in girls. Around 10–20% of cases are familial. Duane syndrome can be associated with extraocular problems (so-called "Duane's Plus"), including cervical spine abnormalities (Klippel-Feil syndrome), Goldenhar syndrome, autism, heterochromia, and thalidomide-induced embryopathy. The majority of patients remain symptom free, able to maintain binocularity with only a slight face turn. Amblyopia is uncommon, if present, rarely dense. Duane syndrome cannot be cured, as the "missing" cranial nerve cannot be replaced. Surgical intervention recommended only when patient is unable to maintain binocularity or a cosmetically unsightly or uncomfortable head posture in order to maintain binocularity. The aims of surgery is to place the eye in a more central position. Again surgery is not needed during childhood and is appropriate later in life, as head position may change further presumably due to progressive muscle contracture.